And the reason I put that in full caps is because he’s Canadian, awesome accent, and loves to shout AT his audience to bring his points across. And to 300 event professionals attending the MPI Techcon on a chilly Chicago morning, he did just that. That morning he brought us new ways of looking at stale event marketing tactics, great belly laughs, awesome real-life examples to illustrate is points, including one about QR codes on bananas, and tweetable pearls of marketing wisdom. 3. Print them out and bring them to your next marketing meeting. Start a brainstorming session. BIG NOTE: Scott has graciously given me 10 signed copies of his books to give to lucky readers of my blog. How awesome is that?! 1. 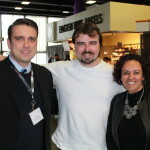 Comment: What was your favorite @unmarketing tweet from #MPITechcon? You can be the lucky winner of one of Scott’s amazing books! 2. Sign up for my updates. Thank you.